Join us as we explore the new E-Series in this 2013 Ford E-Series review. 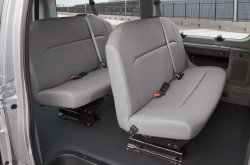 The new 2013 Ford E-150 seats eight, while the E-350 will accommodate as many as 15 passengers. Keeping safety first and foremost, Ford makes state-of-the-art technology available in the acclaimed voice-activated SYNC system. SYNC controls not only communications but also internal audio systems. Your driver can communicate with his dispatcher or offer up sound system selections to the passengers while keeping both hands on the wheel and both eyes on the road. SYNC also includes 911 Assist® for when emergency medical services are required. All E-Series models come standard with AdvanceTrac® and RSC™ stability control systems, which use gyroscopic sensors and auto-engage stabilizing enhancements to resist vehicle rollover. This proprietary Ford technology is not available from other commercial vehicle makers. Have a look at the video and browse the details below to discover why Ford E-150 is an industry leader in commercial multi-use vehicles. When comparing the 2013 Ford E-150 next to the 2013 Nissan NV, GMC Savana, Mercedes Benz Sprinter and the Chevrolet Express, and you'll discover that the E-150 ranks above those autos in oodles aspects. Look over just a few of the reasons below. Grapevine Ford auto repair and service in Grapevine is just a click away! Your Ford deserves to be treated in the best way possible - that means E-150 factory- trained Ford technicians, the reassurance that comes from a 12-month service work warranty and genuine Ford parts and accessories. To keep your Ford in athletic physical shape, put it in the hands of Grapevine Ford's auto repair hot shots. Just a chunk of the services our Ford repair men do includes serpentine belt replacement, engine repair and easy simple inspections. It's very simple: If you want hot shots service and bargain repair prices in Grapevine, make Grapevine Ford your first stop for Ford vehicle maintenance. The link below this text is your boulevard to savings! Click now and you'll be taken to to our coupon specials page! 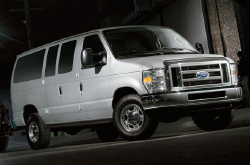 Now that you've read about the new E-Series offerings, we'd like to give you the opportunity to drive a 2013 Ford E-150 here at Grapevine Ford. Allow us to explain some of the E-150's standard features like tire pressure monitoring, anti-lock braking systems and intrusion door beams. We encourage you to bring a list of questions for our knowledgeable staff. Find out about the numerous option packages and how they relate to your business needs for transporting people or freight - or a combination of the two. The E-150's 3,250 lb./237.8 cu. ft. cargo capacity is sufficient for most small businesses in Grapevine, but if your cargo needs exceed these standard capabilities, the E-350's 3,920 lb./278.3 cu. ft. payload performance is an excellent alternative. The tough and reliable E-Series vans have been responding to American commercial vehicle needs for more than 30 years. Come in to Grapevine Ford - just a short drive from Dallas - and see first-hand why so many businesses choose the Ford E-150.